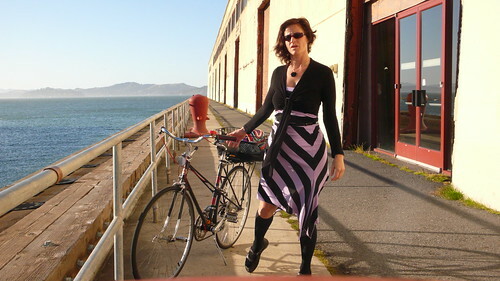 Vélo Vogue: bike date with le rouge et noir + bike party! A couple weeks ago, I attended the most incredible performance by the Lyonnaise acrobatic dance troupe A.K.Y.S. at the San Francisco International Arts Festival at Fort Mason. I was so inspired by the performance - a combination of acrobatics, dance and circus arts on the theme of alienation in the workplace - that I had to see it a second time the very next day. I dressed up and le Rouge et Noir took me out on a date. When I got to Fort Mason, the light and scenery were so beautiful that I had to set up a self-timed shot, that I wasn't ready for, but love nonetheless. I'm quite fond of my asymetrical striped tube-top dress that I found at the Goodwill. 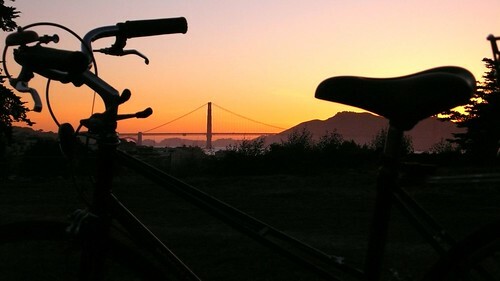 After the show, my bike and I caught the sun setting over the Golden Gate Bridge. L'amour à vélo. 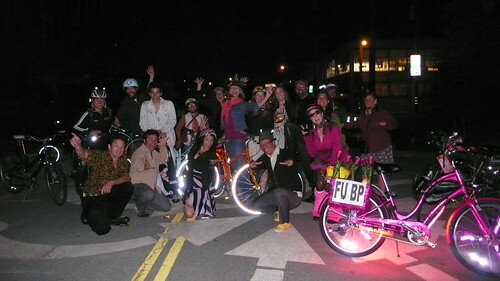 We were actually on our way to meet Deep's FlashDance, which turned out to be canceled, so we ended up doing a fun group ride instead. I got to meet some very nice bikey folks for the first time, like Jeremy, Kimberly and Sacha!